MD&M West is the largest medical design and manufacturing event in the world and Carville once again exhibited at this year’s prestigious event. “As a contract manufacturer dedicated to high precision machining of multiple plastics, events such as MD&M West are a great opportunity for in-depth conversations with medical device innovators and to share our expertise and experience”. With a wide experience in developing & manufacturing medical devices for worldwide medical device companies. We showcased a range of precision manufactured medical manifolds, diffusion bonded manifolds and sophisticated microfluidic devices. Existing clients as well as potential clients visited us at the show to learn more about our medical products and services. In particular, our range of multi-layer diffusion bonded manifolds made from Acrylic™ and Ultem™ received considerable levels of interest. 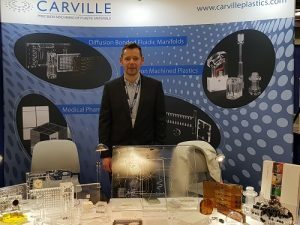 Carville are experts in High Precision Plastic Machining, Multi-Layer Diffusion Bonded Manifolds, Microfluidics, Polishing & Heat Treatment of Plastics. Our core competencies are heat treating, high precision CNC machining, polishing (including vapour), and diffusion bonded manifolds, microfluidics and fabrication of plastics. Offering a specialist contract manufacturing service, we support clients from concept prototypes through to series volume production. One of our specialist areas is High Accuracy Diffusion Bonding (HADB) of materials such as Acrylic/Plexiglas (PMMA) and Ultem (PEI) to produce multi-layer fluidic manifolds. These are often used in Medical, Life Science and Beverage & Food Processing applications. We also produce complex Microfluidic diffusion bonded chip solutions incorporating many features such as mixing chambers, reagent reservoirs, capillary action channels and optical analysis windows.